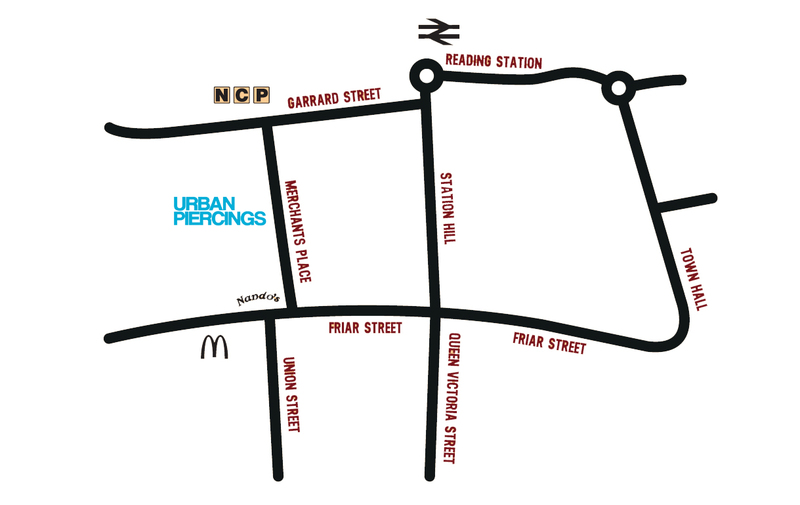 Email us: sales@urbanpiercingshop.co.uk Urban Piercings is easy to find and easily accessible to both drivers and train users, however if you have any trouble finding Urban Piercings please feel free to contact us on 0118 950 2414 or type our address into google maps. By car: There are two main car parks in central Reading; Garrard St. and the Oracle. If parking at Garrard St. Merchants Place is the road opposite the main entrance to the car park, literally under thirty seconds walk. If parking at the Oracle car park make your way to the Broad Street, the main shopping street in Reading. With your back to John Lewis walk down Queen Victoria St.. Take a left on to Friar Street and take a right at Nandos into Merchants Place. By Train: From Reading Station entrance follow Station Road. Take a right onto Friar Street and then a right at Nandos onto Merchants Place.